I realized this morning that it’s National Pancake Day and felt like it’d be a crime to not post a recipe since I’ve been getting so many pancake recipe requests! I don’t like using pumpkin puree in breakfast items like pancakes and french toast since the pumpkin doesn’t have a long enough cooking time to bake off the bitterness. SO, I opt for a spiced pancakes with a deeeelicous maple pumpkin caramel topping sauce and a cream cheese whipped cream to complete the trifecta. 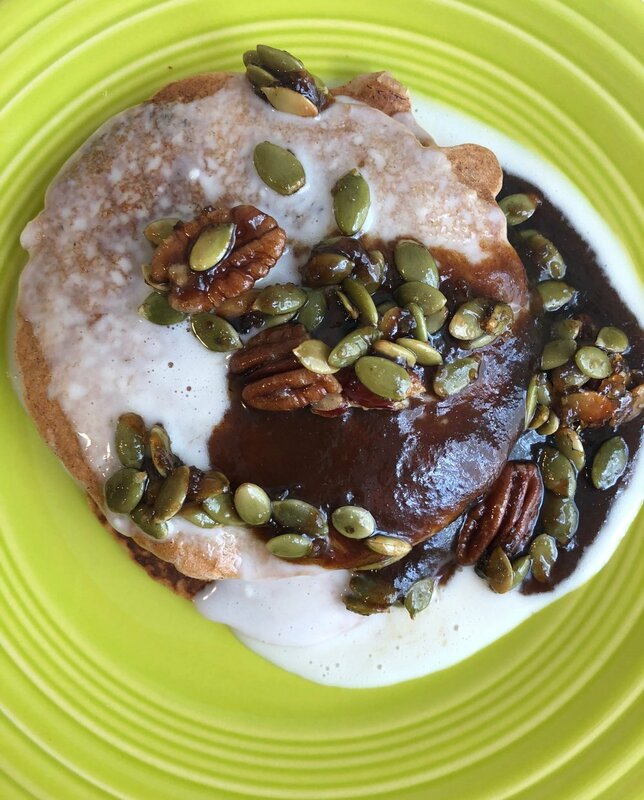 Heads up: Make the pumpkin maple syrup sauce first so it can cool, then make the caramelized pumpkin seeds and pecans, then whipped cream, then PANCAKES, then assemble! 2.) In a large measuring cup, combine the coconut milk, water, canola oil, and syrup and set aside. 3.) In a medium mixing bowl, whisk together the flour, baking powder, spices, and salt. 4.) Pour the wet ingredients into the dry, and gently fold in until just combined. Large bumps are okay. 5.) Spray electric griddle or griddle pan with nonstick spray or vegan butter. Heat pan on medium heat, allow to heat up for about three minutes before adding batter to pan. 6.) Using a ladle or measuring cup, ladle on pancake batter according to preferred size. Flip when you see bubbles in the center of pancakes. Cook for about 30 seconds on other side and transfer to plate and assemble. 1.) Whisk together maple syrup, brown sugar, pumpkin puree, spices, and salt in a saucepan. Cook on medium heat until sauce starts to bubble, about 7-8 minutes. Stir in coconut milk and transfer a measuring cup or bowl. 1.) Chill a bowl in the freezer for 15 minutes. 2.) Whip coconut cream in chilled bowl using high speed for 1 minute. Add in cream cheese and whip on high for about 2 more minutes, or until cream cheese is fully mixed in. Add in powdered sugar and vanilla extract and mix until blended. Chill in fridge until ready to serve. 1.) Preheat oven to 350 degrees. Line a baking sheet with parchment paper. 2.) Stir together brown sugar and butter. Add pumpkin seeds and pecans, tossing to combine. Bake for about 7 minutes. Remove from oven and stir together and set aside.